I got the RV yesterday afternoon! 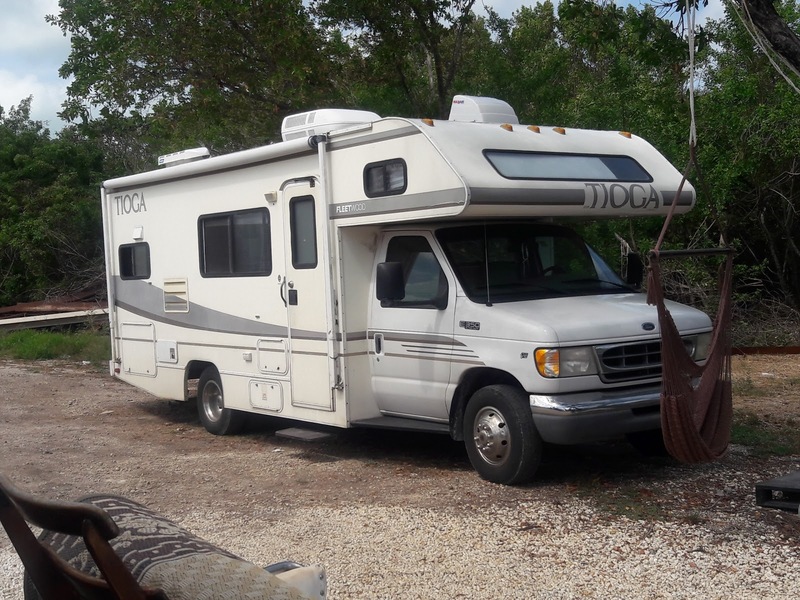 It is a 1999 Fleetwood Tioga that is roughly 22ft long (I don’t know the exact measurement, yet; I’ve got to look at the paperwork). It is in great shape, but the furnishings are a bit dated and worn, but there are no tears or obvious problems. There is a small crack in the bathtub, but nothing that is too hard to handle. My daughter and her boyfriend are here, so I have not had time to just sit and get a feel for the RV, yet. My partner is also very excited about it, and I was trying to avoid my annoyance at having people traipsing through it. I feel like I did when I gave my kids a Christmas gift that required batteries or assembly, so they couldn’t play with it just yet. My feeling about the RV is that I have so much I want to do, and I want people to see it when I’m done. Plus, let’s face it, I just don’t want everyone touching my new place. I am off work tomorrow, so I will probably begin the process of just inventorying what was left in there, and cleaning up. The previous owners were even kind enough to leave their spiced rum and vodka. I just want to sage the place, then sit and meditate in there, while I get a vision of how I want it to appear. The thoughts I had initially are probably not going to work, so I need to feel the flow. For better or worse, RV manufacturers are very efficient about making the most of a small space, so if you want to rearrange something, it tends to involve construction. So, this picture is of the RV from the back looking forward. 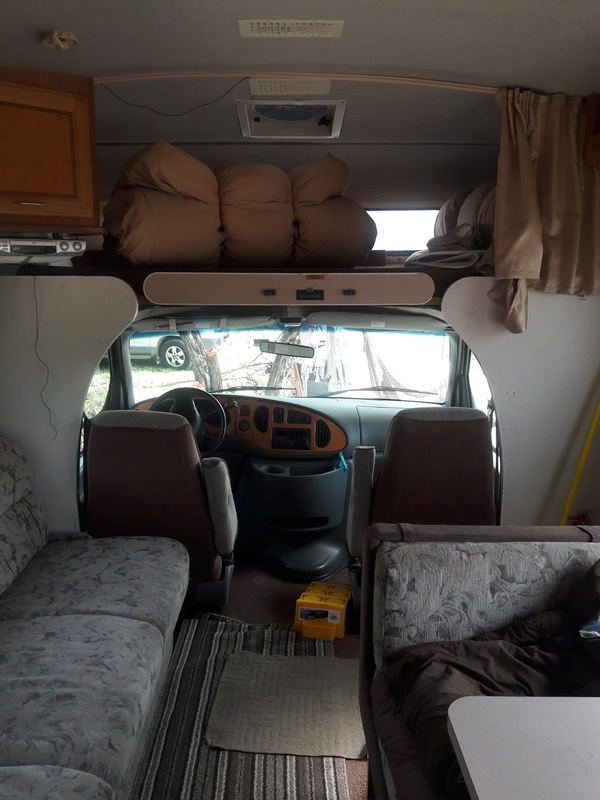 You see the couch (which folds into a bed) on the left, the dining area (which also folds into a bed) on the right, then another sleeping nook above the driving area. If it were only me, I would make the top nook my bed, create plush furnishings, and build some kind of permanent ladder structure so it was like a bunk bed. My partner has been less enthused with that idea, because there is not a lot of space, and he says it makes him feel claustrophobic. He wants to use the area for storage, but I’m not a fan of that idea. The other idea that I had was to remove the dining area, and then I would have room to set up a massage table, so I could see clients during my travels. 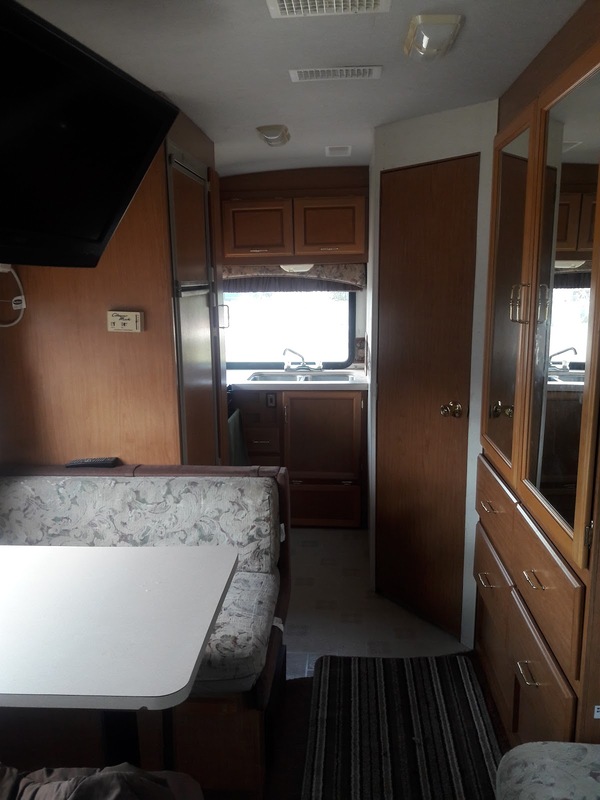 This next picture shows the RV layout from the front looking to the back. The closet is behind the mirrors on the right, the bathroom is behind the door on the right. The window at the very back is above the kitchen sink. There is a stove on the left, and a refrigerator next to that. At first, I was not a fan of the wood, but after sitting in there a bit, I think I will try to incorporate the wood and play it up a bit. I would love to make this look almost like a treehouse, bringing a look like this picture below into it. I love this rustic look, and we could definitely bring some wood facade elements to simulate the look, without making it really heavy and bulky for the road. Well, these are some of my initial thoughts on the RV. As I get busy working on it, I’m sure we will have to adapt. I would love to include a decorative porcelain (looking) kitchen sink, and some nice design elements. I want this to be both our weekend travel home, as well as a possible future tiny home. If you’d like to see the entire RV, check out my video I took below. If you have any ideas, I’d love to hear them!